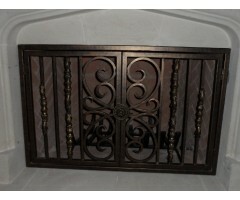 Iron fireplace screen - ornate metal selection ..
Ornate metal double doors with center rosettes. 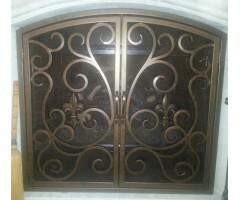 ..
Ornate scrolled double door selection with fleur de lis center pieces. .. 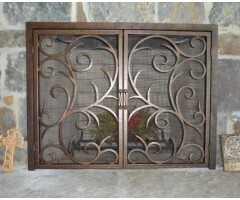 Double doors framing beautiful round scrolled tendrils wrapped in realistic leaves, and complimented with gorgeous twisted iron handles. .. 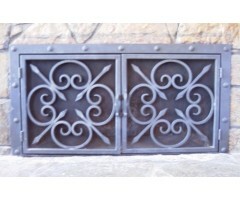 Double door center scrolls with a rosette handle and decorative collars on either side. .. 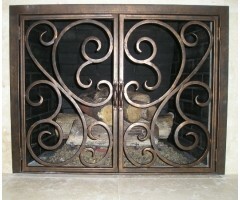 Double door fire place doors with identical rosette doors are framed with flat bar accentuated with hand forged rivets. 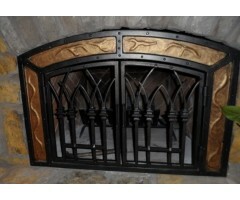 ..
Rectangular double door fire place doors with a tightly detailed design. .. Very appealing design displaying a balance of scrolls and flame like features. 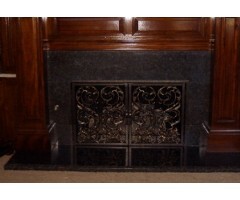 ..
Uniquely attractive set of fireplace doors created with a heavy iron flared and collared bar resembling a flaming torch. 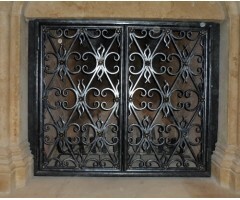 The outside edge was also custom designer per the client's request. 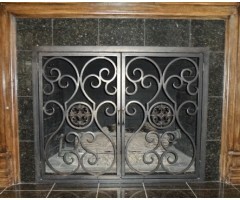 ..
Ornate double door fire place doors surrounded by granite and custom woodwork make a gorgeous impact as the center focal point in this room. .. 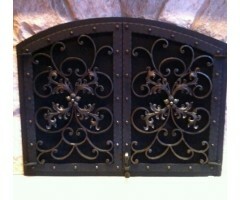 This is a show-stopper arched double fireplace door! 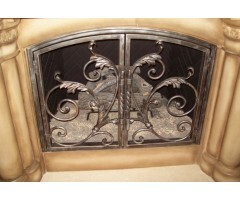 Exquisitely detailed with 2 floral/leaf sprays. Framed with hammered edge flat bar and accented with hand forged rivets. The hardware is crafted with a drop bolt. .. 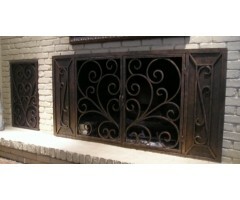 This full wall fireplace was beautifully completed with a double door unit and extended side panels. We coordinated another door to the left to enclose the wood storage. ..